The following are a list of types of shows that are available along with pricing. If you have any questions, or would like to request a booking, please call (403) 560-6416. When booking, please inform us if you require the dancer to bring a stereo. If a stereo is required, there is a $10 + GST charge. Please note that on New Year’s Eve all show fees listed below double. Senior Residences and Charitable Organization please inquire about our special rates. All out of town shows are subject to mileage of $0.52/km + GST. All overnight accommodations and meals are additional costs. To read comments from previous clients, please go to the Show Testimonials page. 20 to 25 minutes show length for $250 per dancer (GST included). 10 minute show length for $150 per dancer (GST included). 5 minute show length for $95 per dancer (GST included). 20 to 25 minutes show length for $225 per show per dancer (GST included). Additional Information: If contracted for a minimum of 4 shows per month, cost is $125 per show (GST included). Varies depending on length of show and how many dancers (rough estimate of $135 per dancer (GST included). $105 per hour (GST included) for a minimum group size of 5 people to a maximum of 10 people. For each person over the maximum group size of 10, a $10.50 per person fee is charged (includes GST). For example, if there are 13 students in total for a 1 hour lesson, the cost will be $105 + (3 times $10.50) = $136.50 per hour of instruction. 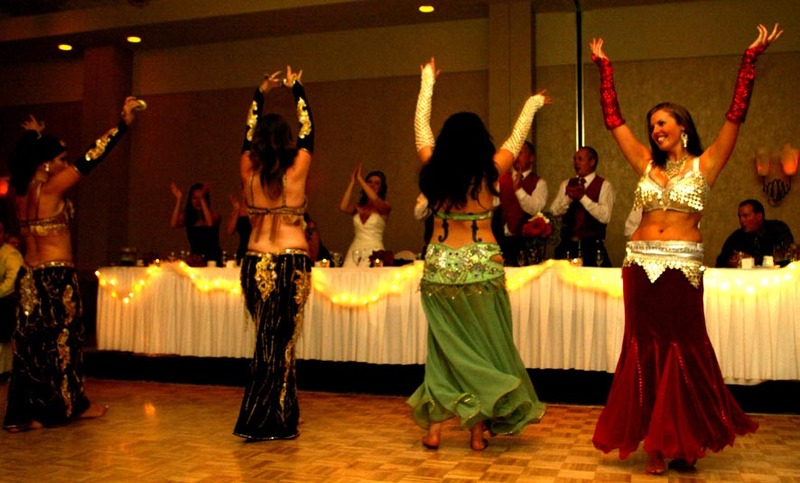 Additional Information: The instructor will be teaching in regular fitness wear (not a belly dance costume). If you are interested in a performance in full costume as well, the above show fees apply in addition to the cost of the lesson. $85 per hour (includes GST) for a minimum group size of 2 people to a maximum group size of 4 people. 1 on 1 instruction for $55 per hour (includes GST). $80 per half hour (includes GST) for a minimum group size of 5 children to a maximum of 10 children. For each child over the maximum group size of 10, a $5.25 (includes GST) per child fee is charged. For example, if there are 13 children in total for a 30 minute lesson, the cost will be $80 + (3 times $5.25) = $95.75 per half hour of instruction.